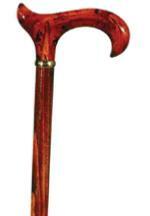 A very stylish derby cane with an amber-effect handle in highly polished acrylic. The shaft is hardwood with a cherry-effect varnish and is fitted with a smart brass collar. The derby handle offers excellent support to the hand, and may be hooked over the arm when not in use. Fitted with a rubber ferrule. Ferrule diameter 19mm. Overall height 87cm (34").